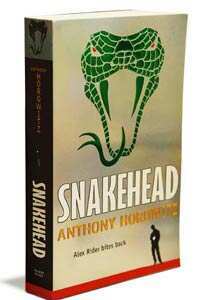 Snakehead: By Anthony Horowitz, Walker Books, 398 pages, Rs386. After six extremely successful Alex Rider novels, Anthony Horowitz hardly needs an introduction, but here goes. The 51-year-old Englishman, according to his website, is the son of a “fixer" for Harold Wilson when he was prime minister of Britain, and had a miserable childhood, especially in boarding school. So what’s with Rider? More information from Horowitz’s website reveals that to relieve his misery and that of the other boys, he made up tales of astounding revenge and retribution. He found solace in boyhood in the escapism of the James Bond films. He claims his two sons now watch those films with the same tremendous enjoyment as he did at their age. Bond’s glamour translates perfectly to the 14-year-old psyche. According to him, “Bond had his cocktails, the cars and the clothes. Kids are just as picky. It has got to be the right Nike trainers (sneakers), the right skateboard. And I genuinely think that 14-year-olds are the coolest people on the planet. It is this wonderful, golden age—just on the cusp of manhood—when everything seems possible." Alex Rider is all that, and more. Two years after Ark Angel, Horowitz throws up a delectable cocktail of vengeance, drug-running and breathtaking action in Snakehead. The book opens with Rider splashing down from space after satisfactorily dealing with some enemies of the world. The reluctant teenage spy (he is still reluctant despite six adventures) lands in Australia, is picked by the Australian Intelligence Service and, with a bit of cunning manoeuvring, is drafted in for a mission that reminds one of Ark Angel. In that story, Rider has to find and destroy the evil gang which is planning to blow up a space station, sending it plunging directly on to the Pentagon (shades of Moonraker—the film not the book—but the Ian Fleming influence is there in all of Horowitz’s Rider stories). Rider is the young Bond. Rider has an ally in this game—his godfather and the best man at his father’s wedding, the enigmatic Ash. He is also the reason why Rider agrees to go on the mission. Ash knows a lot about Rider’s past. The exchange: Rider’s past for his participation. Disguised as Afghan refugees, the duo traverses Indonesia, Thailand and Australia to defuse the threat. And all along the way, there is danger lurking. From Rider’s bout with Thai boxers and his narrow escape from a Snakehead den to the desperate attempt to defuse the Royal Blue and finding out the truth about Ash, Horowitz grips you. Stormbreaker (also a movie whose screenplay was written by Horowitz), Point Blanc, Skeleton Key, Eagle Strike, Scorpia, Ark Angel, and now this. Horowitz is at his raciest best here. The man himself has been a busy writer since he was eight. Professionally, he started writing when he was 20. He wields his pen in a comfortable shed in his garden for up to 10 hours per day. Besides the Alex Rider books, he has written episodes for several popular TV crime series such as Poirot, Murder in Mind, Midsomer Murders and Murder Most Horrid. The writer is the editor of Heek, (e-heek.com) a children’s magazine.